Management and strategy to deliver technology solutions to support the firm’s business processes. We develop the technology strategy for hedge funds and other trading organizations necessary to deliver solutions to support the firm’s business processes. The challenge when developing a technology plan is adapting to rapidly evolving business needs while balancing competing priorities. The goal is to build a robust, resilient, and scalable technology platform while ensuring solutions are delivered quickly, on-budget, and are easy to implement and support. Technology is a critical component of the investment and trading process, and all business groups require appropriate technology solutions to be effective. We offer technology-related executive management, strategic planning, process re-engineering, and implementation project support through senior level technology and business operations consultants. Developing technology solutions requires us to consider the necessary data needs, the possible application options, and the required infrastructure to support proposed solutions. 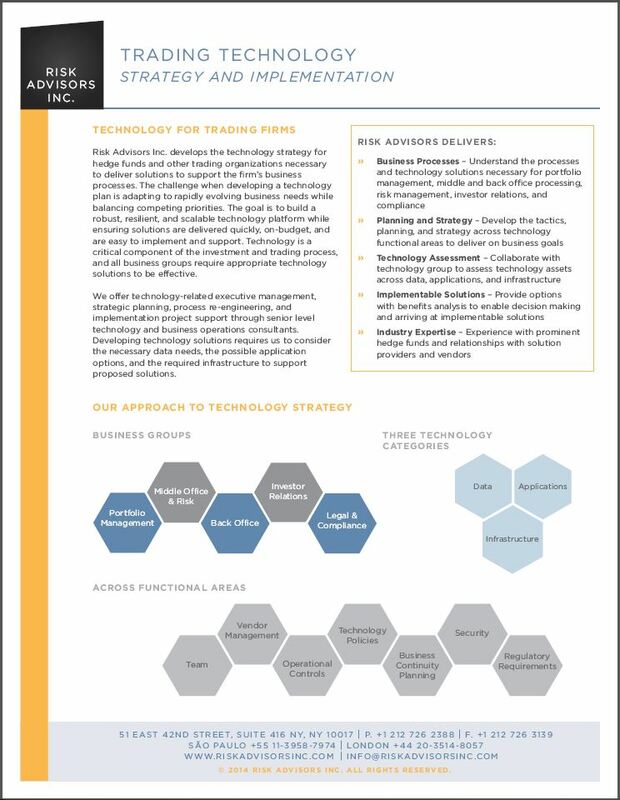 While crafting a technology strategy, we focus on the business processes of each group, the overall needs of the firm, and an understanding of technology best practices from interactions with peer firms. We then translate this strategy into specific technology project goals and milestones. 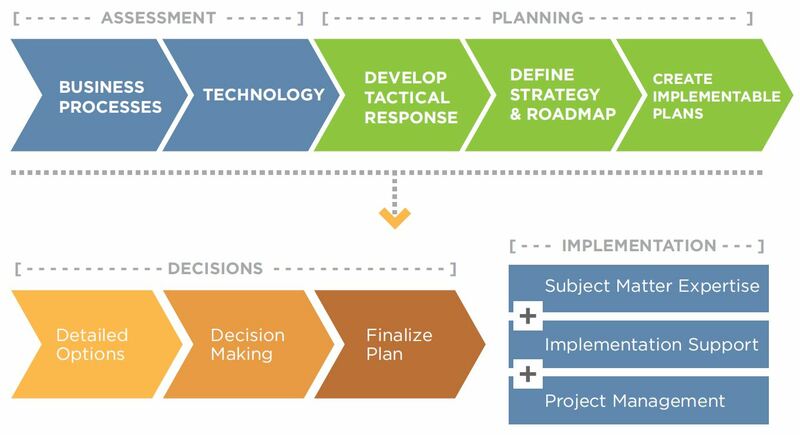 Once a roadmap and strategy are established, we assist in assembling the implementation resources (i.e. internal team, third-party resources, and vendor solutions). We support the implementation effort with our subject matter and management expertise. This includes specific delivery of complex implementation tasks, detailed project management, and reporting to stakeholders and senior management. We solve urgent problems first. We help develop tactical responses to pressing issues and quick-to-solve problems. Once the urgent and the easy-to-solve problems have been addressed, we collaborate with the business groups, the technology group, and senior management to develop a detailed technology strategy and roadmap. Core to our process is facilitating and managing the discussion between business groups and mediating competing needs to develop a prioritized list of proposed technology requirements. Then, in collaboration with the firm’s technology group and key vendors, we develop proposed implementable solutions. 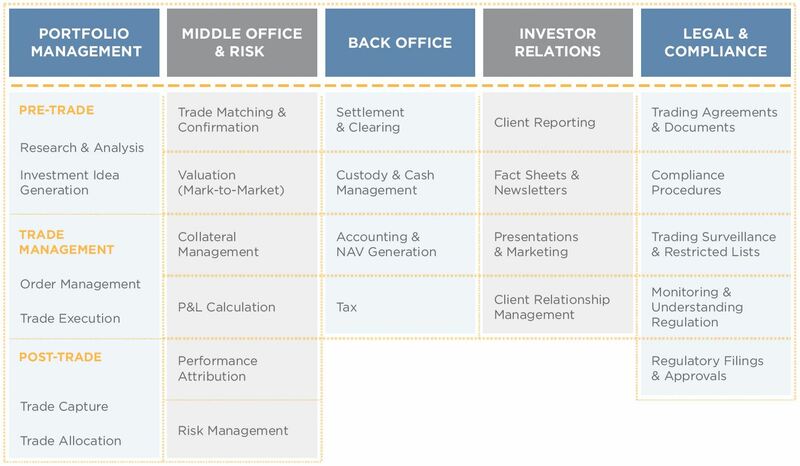 Our process begins with a dialogue with the firm’s business groups to understand the fund’s investment strategy, its business processes, and the needs of each of the firm’s trading and operational areas. While crafting a technology strategy, we focus on the business processes of each group, the overall needs of the firm, and an understanding of technology best practices from interactions with peer firms. We then translate this strategy into specific technology project goals and milestones. Data is consumed and produced by the various business groups and includes external sources of data such as market data from providers (e.g. Bloomberg and MarkIt), trade orders and executions, calculated P&L and performance attribution, and accounting and financial reporting data. Software applications support key activities such as research, trading, valuation, accounting, client reporting, and compliance. Core applications such as order management systems, portfolio management systems, and portfolio accounting systems span across business groups. Applications consume both external and internal sources of data and produce additional data that are used for reporting, analysis, or downstream processing. Data and applications depend on a robust technology infrastructure that requires planning, installation, and management. High-availability, redundancy, and resiliency is vital in a trading environment. Several opportunities exist to use managed services and outsourced providers to create a best-of-breed environment in a cost-effective and scalable manner. Assembling and managing the team is crucial to delivering technology solutions. We can help determine the skillsets required within the technology group and the team organizational structure, and suggest staff augmentation solutions when appropriate. We have access to a seasoned talent pool through industry relationships, professional recruiters, and third-party professional services firms. Understanding the vendor landscape provides access to the technology products and services available. Through established relationships with various top competing providers, we can help you navigate the options and help select the right vendor mix. We can facilitate the vendor selection process and continue to manage the relationship through the engagement. Establishing verifiable operational controls help mitigate operational risks and ensure a stable production environment for critical business applications. Documenting controls and acquiring certifications such as the SAS 70 and the newer SSAE 16 help due diligence reviews and demonstrates to investors the firm’s commitment to operational standards. Implementing clear technology policies removes ambiguity and reduces security risks and the risk of unplanned changes. 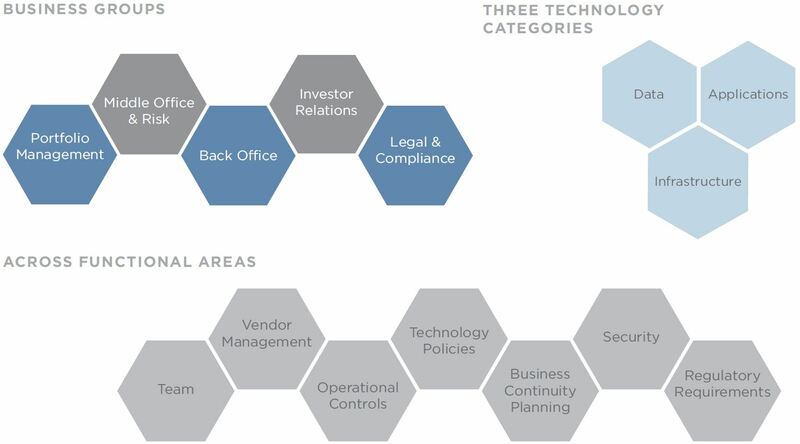 The three critical technology policies are security, change control, and end-user support. We help firms implement these policies and work with business and technology groups to ensure acceptance. Developing a business continuity plan (BCP) and implementing disaster recovery provisions for a trading technology environment is challenging. Investors and regulators expect that these processes and resources are in-place and that the firm maintains a current business continuity plan. However, BCP is not just a technology solution; the human element is even more important. We assist in creating an emergency response team, communication protocols, and an overview of your business flow in a disaster scenario. Monitoring for security effectively requires both technology solutions and human behavior. Security is a broad topic and encompasses areas such as user access, data protection and encryption, virus protection, network security, and physical security. Adapting to evolving regulation requires an understanding of how new regulations impact the firm’s technology requirements. In the US, the SEC and CFTC have mandated rules that affect trade surveillance systems, email retention, voice recordings, trading data storage and retrieval, and hedge fund regulatory filings such as Form PF and Form CPO-PQR. Additionally, international regulators are adopting similar requirements such as the AIFM Directive in the EU.